When I ran into this book, published in 2016, I thought (hoped) that it would be a recent publication with an esoteric take on Freemasonry. In a way it is, but not the way I hoped. 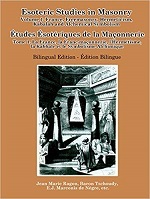 The book contains old texts about: “France, Freemasonry, Hermeticism, Kabalah and Alchemical Symbolism”. They are presented in two languages. The left columns are English translations, the right columns are the French (original?) texts. There are texts that I do not know otherwise available in English such as texts from J.M. Ragon and L. Travenol. That make the publication, in a way, interesting. Most of the book consists of catechisms, Masonic Q&As. These usually tell you something about the rituals, but they are not ritual texts themselves. These catechisms are presented per grade: Entered Apprentice, Fellowcraft and Master Mason or equivalent. The latter I say because texts are presented from different Masonic orders such as the Rite of Memphis Misraim and adoption Freemasonry (pre co-Masonry Freemasonry that included women) where terms and symbols sometimes differ. The book makes a mildly interesting read. You can, to some degree, compare symbols and ways of working from different Rites. There is one part with completely alchemist Masonic catechisms which show that alchemy once formed a major part of Masonic symbolism (at least in some organisations) with pretty practical information too. The more studious parts of the book are of the usual 18th and 19th century shallowness. Nice to read, not enough to study. I am unsure if the author is a Freemason himself. I guess not, because here and there (s)he added passwords where the original texts have none. Also some translations are weird when you know something of Masonic symbolism. Perhaps they are correct in French, but a literal translation to English make them incorrect or at least strange. There are other volumes in these series. I am not sure if this first volume interested me enough to continue with: “The Gnostic and Esoteric Mysteries of Freemasonry, Lucifer and the Great Work”. Under the pen-name Daath Gnosis esoteric and occult publications about non-Masonic subjects have been published as well.